With Thanksgiving in the rear-view mirror and the first of December upon us, it&apos;s time to get out your calendar and plan all of the fun winter/holiday activities you&apos;re going to do in between cookie parties, office parties, family parties, shopping, cooking, baking and hopefully at least a little sleeping! Not to worry, whether you&apos;re naughty or nice, we here at Visit Rhode Island are here for you. We can&apos;t write out your Christmas cards or cook your holiday feast, but we can give you all of the information you need to have an amazing, magical holiday season. So, put your game face on, because you&apos;re schedule is going to be packed with holiday cheer from now until New Year&apos;s! Ho-Ho-Ho! There are so many wonderful things to do with your family this month - particularly the little ones. Make your list and check it twice, because you won&apos;t want to miss out on the fantastic holiday fun! Looking for some grown-up fun this month? Perhaps over a cup of good cheer? When the weather outside is frightful, these events will be delightful! 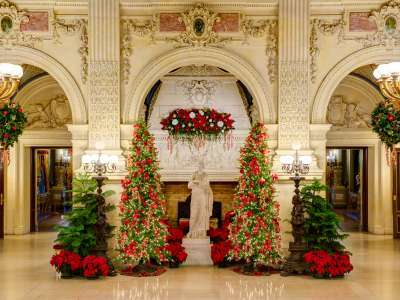 December is the month where Rhode Island&apos;s palatial mansions and historic homes put on their holiday best and show off a little. Even if you&apos;ve visited The Breakers, Hearthside House, Blithewold, Clouds Hill or any of our other grand homes, you&apos;ve never seen them quite like this! Do you hear what I hear? Christmas carols and other songs of the season - not to mention holiday classics like A Christmas Carol, The Nutcracker and It&apos;s A Wonderful Life. There&apos;s so much to see and hear this month, you&apos;ll want to shout joy to the world! Whatever you&apos;re celebrating this month, we at Visit Rhode Island wish you a joyous holiday season! And be sure to check out our new Holidays & Winter in RI page to get the full picture of everything going on in the Ocean State through New Year&apos;s.